With views to Stirling Castle you will love the tranquil setting of Lallybroch. Lallybroch ( named after the fictional Estate in the award winning TV programme, Outlander) is an impressive 5 bedroom house. With bedrooms called after the characters: Ferguson, Frazer, Wallace, Campbell and MacKenzie you can recreate your own wee bit of Outlander during your stay!The steadings conversion is set on the Kersebonny Carse just outside Stirling within easy reach of all amenities and historic sites, yet in a very tranquil setting. Recently modernised and furnished to an exceptionally high standard this unique property offers a twist on the traditional farmhouse. 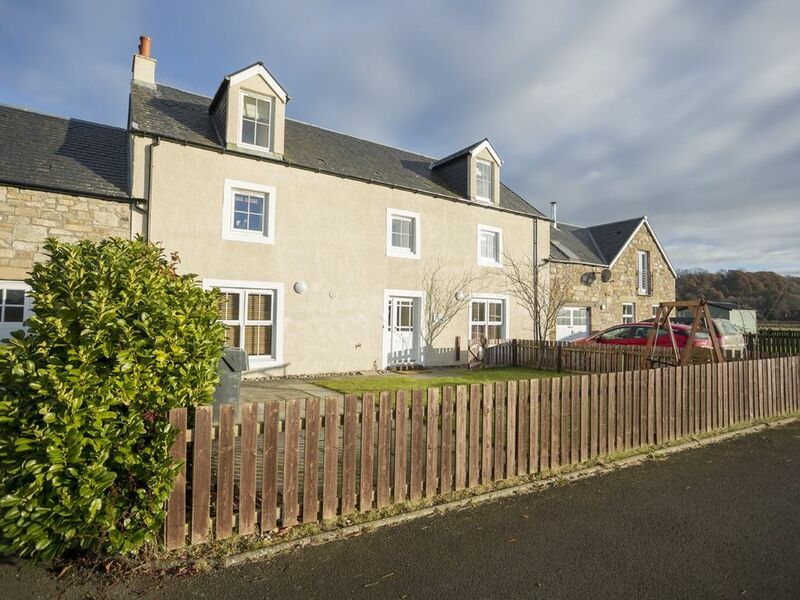 With views to Stirling Castle from the bedrooms on the top floor this house will provide a perfect base for your holiday in Scotland. Set over 3 floors there is ample living and dining space for up to 10 people. The accommodation comprises of an impressive, spacious lounge with fireplace, gas burner log fire and large plasma Freeview TV. There are patio doors leading from this room to the shared rear patio garden. This room is a wonderful place to relax in with comfy seating for up to ten guests. The fully fitted farmhouse kitchen has everything needed for a comfortable stay: large farmhouse table that can easily seat ten people, dishwasher, range cooker with 5 ring gas hob and 2 electric ovens, microwave and American style fridge/freezer. The kitchen leads to a seperate Utility Room with washing machine and tumble drier. Also on the lower floor is a small cloakroom with hanging space and a separate WC. On the first floor there are 3 bedrooms: the master King-size en suite with large walk in drench shower and large walk in closet. A further king-size bedroom and double ensuite bedroom complete this floor. On the top floor there are a further 2 bedrooms: one king-size and one with zip and link beds giving the option of either 1 x king-size or 2 x single beds. This floor also boasts 2 further bathrooms both with over bath showers. We are delighted to hear your lovely comments. So very happy that you enjoyed your girlie weekend. We look forward to welcoming you back again next year. What a great house. Must admit that the creaky floors added some character to the property but could be little disconcerting during the night. However the property was brilliant with a superb location being central from Edinburg and Glasgow and the Highlands. We were greeted warmly by Caroline and quickly shown around the property. We did not have to bother her again until we left. The kitchen is well appointed with all one would need to cook either a full meal or snacks. The living room was huge with a large screen TV and the 5 bedrooms were fabulous. There was so much to see and do that time ran out but there is plenty more for another trip. Thank you so much for taking the time to write us a lovely review. It means a lot to us. I am glad you enjoyed the house as much as we do. Comfortable, clean and welcoming with plenty of room for our group of 10. A home away from home. Lallybroch farmhouse was comfortable, well equipped, and spacious. We were most impressed with our house manager, Carole who went out of her way to make our stay in Stirling one that we would not forget. Thank you, Carole for your advice and your warmth. Very well decorated and equipped. Handy for Stirling and central Scotland while being away from the bustle of the town. Creaky floorboards add to the character of the house. Set in a quiet steadings conversion approx 1 mile from the city centre.